Several years ago, a friend of mine lent me a book on the history of my paternal grandfather’s and my father’s hometown. This small village, where I lived for most of my life, was founded in the Middle Ages and has witnessed many historical events, such as the war European principalities and city-states fought against the Ottoman Empire or the conquest of Northern Italy by Napoleon. In essence, I wanted to know a little bit more about the history of my town, as it has played a significant role in the history of my family, too. As a matter of fact, the book turned out to be more than simply a history of the town. Since it was written by a historian, the sources used by the author are rigorously cited in the bibliography. Here, I noted unexpectedly a couple of items referring to some mysterious documents of the seventieth century written by multiple authors. One of them had the same last name as mine! Needless to say, this fact immediately triggered my curiosity and I just couldn’t resist digging into it. At that time, I had never tried to trace my family tree, even though I had been thinking about it. The bibliographic index was compiled so well that the physical location for each source was indicated, too. Surprisingly, I found out that there are documents about my small town in libraries and archives all over the world. 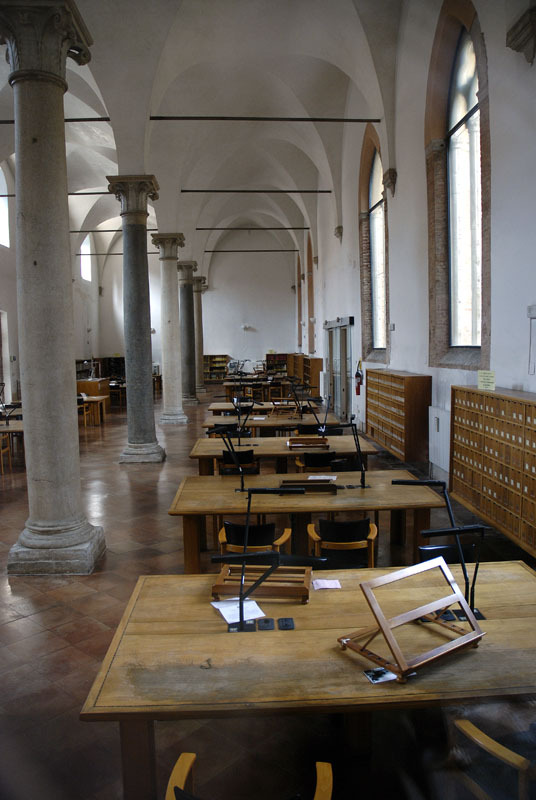 Luckily, the two documents I was interested in are archived in the city of Venice. Thus, I jumped on the first train headed to Venice because I couldn’t wait to see those papers with my own eyes! 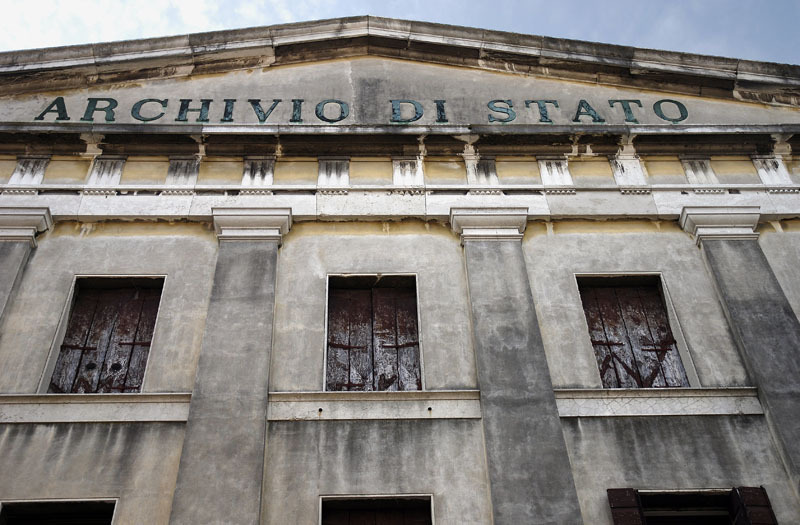 The documents are stored in the State Archive, a monumental building in the heart of Venice, that originally was a convent. I went there in the spring of 2011 accompanied by my partner. I was excited to discover a bit about the life of a person who might have been one of my ancestors. Unfortunately, as soon as we got in front of the building’s entrance we realized we wouldn’t be able to make any memorable discoveries that day, as the archive’s personnel were on strike! As I described in some previous posts on this blog, we Italians are so accustomed to these annoyances that we are almost indifferent to them. We take for granted that such things are not only possible but even likely, so we don’t give them too much importance. We just move on and try to cope with the situation the best we can. In this case, we took the opportunity to hang out in Venice, whose decadence is always something special. We returned the following week and finally managed to enter the archive. We were treated like regular researchers—graduate students, teachers, fellows, etc.—who spend months or even years inside that building. We were assigned a locker where we put our personal effects. Then we had to complete the identification process, after which we moved to something resembling a reading room. It looked like the reading room of a regular library except the air smelled of history. It reminded me of the dark, dusty rooms in which Indiana Jones carried on his own research to dig up anything that could lead him to find the new Holy Grail. When we entered the room, there were several researchers working on old books and ancient documents. In that very moment, I felt like I was violating the sacred atmosphere of that place. I felt like I was an intruder, even more, when we approached the director. He was sitting behind a large hardwood table that looked like a teacher’s desk and that was raised with respect to the floor, being positioned on a sort of small stage. He had white hair and a long white beard. All of this made me think of him as a sort of threatening god of the archives, sitting on his throne and ready to punish the disrespectful visitors who dare to violate his temple. We addressed him timidly asking for information. Solemnly he looked us up and down, from head to toe. His face clearly revealed a mixture of disgust and contempt but he knew he could not neglect his duty. He explained to us reluctantly the procedure we had to follow to access the documents. In brief, we had to fill out a form indicating their exact “coordinates” within the archive. Then, an operator started to travel through the labyrinth of the archive which consisted of 80 km of shelves. After a while, he surfaced from this disarray with the documents we requested lying on the top of a cart. They were in a large folder that was then put on a wide table in a different room. We were escorted there where we were told how to handle it. We were allowed to flip it through ourselves but we had to follow some rules to avoid damaging it. When we started to browse through the folder, we realized that it included a lot of different documents. We knew from the book’s bibliographic index that the papers we were looking for were maps. They were hand-drawn by a sort of notary who was in charge officially of measuring some plots (if I understood correctly, to settle a dispute between landowners). The measurements were carried out with the help of two “surveyors” (called meriga in the original document), one of whom was named Antonio Marson. All of the documents in the folder were handwritten in the seventieth and in the eighteenth centuries, and most of them were maps. Therefore, it wasn’t that easy to identify the papers of interest but, after a while, we finally came across the right ones. Handling and reading these documents was like entering a time machine. On the map, we could read the names of some roads and buildings which we still use nowadays. With the help of our imagination, we tried to picture in our mind how the town looked at that time. The documents were quite large (615x440mm and 580x445mm) and the hand-drawn maps were accompanied by textual notes describing the measurement process and, if I understood correctly, the fees that were charged. Even though the language used is quite similar to contemporary Italian, I couldn’t understand all of the words. Right now, I am still thinking about finding someone who can help to translate the texts into a more readable form. As a matter of fact, I would have loved to publish the documents here but, unfortunately, I am not allowed! The reason why I can’t do that is worth hearing. Anyway, to date, I still don’t know if Antonio Marson is one of my ancestors. But I met some people recently who can help me to find out. I think there will be further developments, as I find all of this more and more intriguing. Stay tuned!